Last night at UFC on FX event, surprises were delivered in abundance. Starting with the main event, it was difficult to understand why Bisping seemed to struggle with putting together an offense against a man he was repeatedly promising to handedly put away for months prior to the event. Last night Belfort floored Bisping with a head kick, neatly tipping the middleweight division upside down by taking out it’s current number one contender. What’s even more bizarre is what happened afterwards in Belfort’s post fight interview with Jon Anik. Snatching the mike from Anik, Belfort denounced Sonnen as the number one contender, yelling profusely that he himself should be next for the UFC light heavyweight champion, Jon Jones. For a man who was sitting at 3-0 in the middle-weight division, he didn’t need a loss apparently to deftly remove himself from the middle weight title picture altogether. Belfort is a beast and deserves big match ups with champions like Jones, but what he must not have realized before he stepped in to the cage with Jones late last year at UFC 152, was that he was stepping in as a replacement, not a true top contender. For those of us who remember correctly, he hasn’t been relevant in the light heavy-weight division for some time since he hadn’t fought as a light heavy-weight in the UFC since dropping a close split decision loss to Tito Ortiz at UFC 52 in 2005. On a side not, that event was titled, UFC 51: Super Saturday (more like super weird). Therefore if he really wants a shot at Jones, that’s not good for the middle-weight division, or relevant in the light heavy-weight one either. Now with both Bisping and Belfort out of the title hunt, for once there really aren’t many options for the champ at the moment. 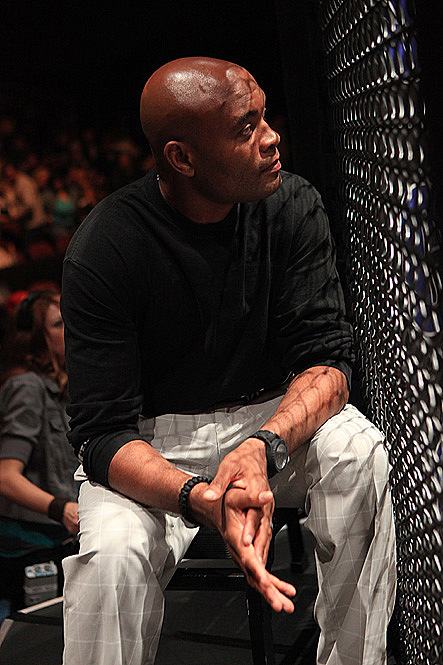 If you really look at Anderson Silva’s situation, he’s probably wondering who he will fight next, much less in the ten matches he has lined up under the newly minted contract he signed the other day. Watch the video below to hear his thoughts on the title picture after he watched UFC on FX last night. Let’s run through those who have recently dropped out of the middle-weight title race. Georges St Pierre is not going to fight Silva, so he’s out. Tim Boetsch and Alan Belcher were both riding four fight win streaks and ironically both lost on the same night at UFC 155. That night was a pretty incredible night of upsets that saw them drop losses to Costa Philippou and Yushin Okami. Even more incredible was the one sided beat down JDS suffered from Cain Velasquez. At least we know that all the men who have been losing to each other were probably not going to serve much of a threat to the champ to begin with. But with the thinning of the middle-weight herd, a couple viable options still exist. With Chris Weidman hurt but still very reelevent, Luke Rockhold has the strongest argument for a shot at Silva, until Weidman’s return. Infact, before Bisping vs. Belfort happened, Rockhold laid out his opinion on the middle-weight division and the road he wanted to go down en-route to a title shot, with mmafighting.com in the quote below. Unless Weidman’s injury heals up quickly, I believe Rockhold will be granted an immediate title shot. If anyone doesn’t think it’s a strong possibility at the moment, just look to his counterpart Strikeforce champion in Gilbert Melendez, who will fight Benson Henderson at UFC on FOX 7. My point is if one Strikeforce champion can be granted an immediate title shot, albeit a much higher ranked one in his respective division among the light-weights, so can another. The dark horse who is still in the process of establishing himself as a contender for Silva is former Bellator middle-weight champion and judokan Olympian, Hector Lombard. With his knockout ability and impressive MMA record, he’s right up there with Rockhold. All he really needs is one more highlight KO inside the Octagon to begin entering talks as a possible opponent for Silva as well. Don’t forget about Jacare Souza either. He’s definitely flying under the radar since he lost to Rockhold in Strikeforce, yet is on an impressive three fight win streak since then. Personally he already feels like he’s in the UFC to me since his last win was against UFC veteran Ed Herman, who came over to Strikeforce for a one off against Souza for the promotion’s final event. Souza may have lost the Strikeforce strap in 2011 to Rockhold, but it’s apparently made him a better man for it and possibly a future number one contender for Silva in the process. I’ll finish on this note, Weidman is the man who arguably has the most legitimate argument for a shot at Silva and yet is the most unlikely to receive one until his return from injury. Until then it’s Rockhold, Lombard, and possibly Souza. At least that’s what I think UFC match maker Joe Silva is thinking right now, if I had to put money down on it.